This December has been pretty busy, between preparation for the school-wide singalong (which is tomorrow), my choir concert (which was last week), and Christmas shopping (which is constant!) 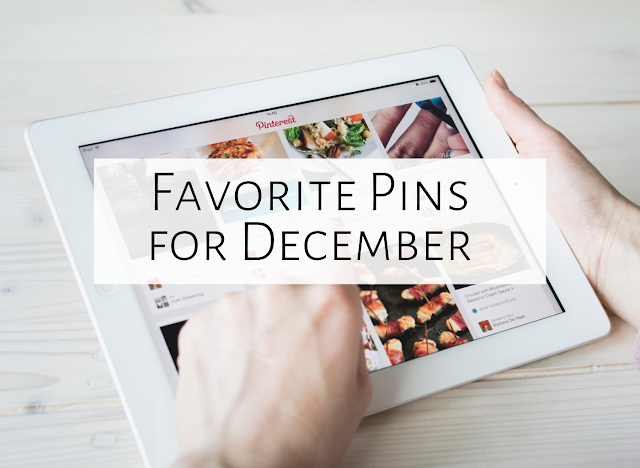 Still, I wanted to take some time for my five favorite pins of December! How cute is this? I plan on printing this out and posting it in my room. It would be especially beneficial to my band and recorder students. If you click the picture above, it will take you to the website, where you can print this out for free! I'm not sure who originally posted this (as the pin is linked to a picture, not to a blog or website), but it is so cute! 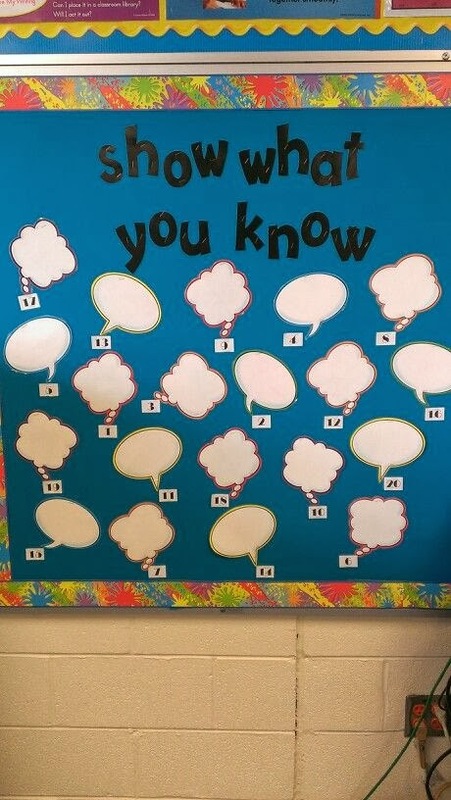 You can use speech bubbles as exit slips, or to have students write about a specific concept. You might even have students write their speech bubbles in learning centers, then post on a bulletin board later. For example, if the learning centers are about instrument families, then the students can write what they know about instrument families. I was excited to find the speech bubbles below for free on Teachers Pay Teachers; just click the picture to download the clip art! 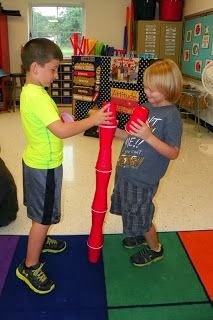 #3: Cup stacking activity to "Carnival of the Animals"
In her blog, Mrs. King discusses a cup stacking activity for "Tortoise" from "Carnival of the Animals." 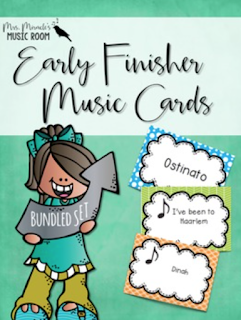 Great for listening to the piece AND to improve problem solving skills! Click the picture above to read the blog. 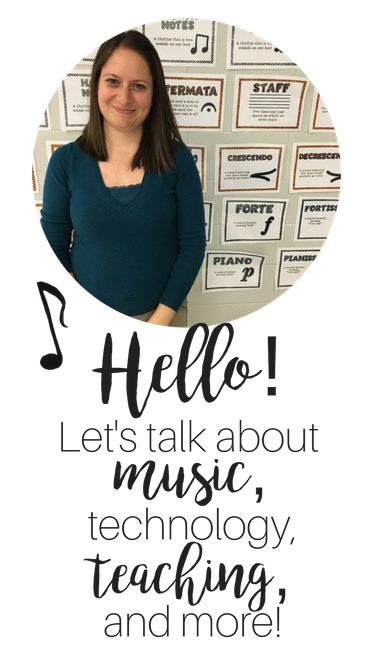 Click the picture above to watch a really cute video of a lesson for "I See a Song." Kindergarteners create their own compositions with instruments, inspired by the pictures in the Eric Carle book. Love it! I found this blog by Ashleigh and loved the idea of having a way to keep students engaged when they finish early. I also loved the cute way she displayed these cards with a flip flop holder...but as cute as her cards are, they wouldn't work in my classroom, since I teach music. I can also see this working during centers. Sometimes I have centers that don't take as long as the other centers going on, and then students are just sitting there waiting (or drawing pictures on the back of their worksheets!) Instead, students can grab one of these sets of cards and have something to do. I also think these would work really well while students are lined up waiting for their teachers to pick them up. 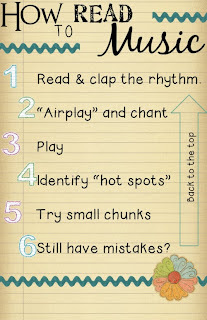 Sometimes I have students sing songs, and sometimes I ask them questions, but these would be really effective to keep them engaged until they leave the room! I included directions in the sets on how to display the sets using flip flop holders from Boottique like I did (the holders are $10 each, plus shipping), but I also included directions to store the cards without the flip flop holder. These pins have once again inspired me to try out something new and engage the students in new and exciting ways! I hope you found something useful too. Make sure to click the link below to see the favorite pins of other music bloggers. Happy pinning, and happy teaching!